YAY! Only 3 more sleeps 'til Halloween! 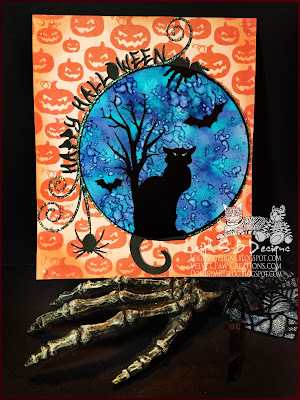 Over the next 3 days I'm going to share some luminary cards I've been making as we count down to Halloween. 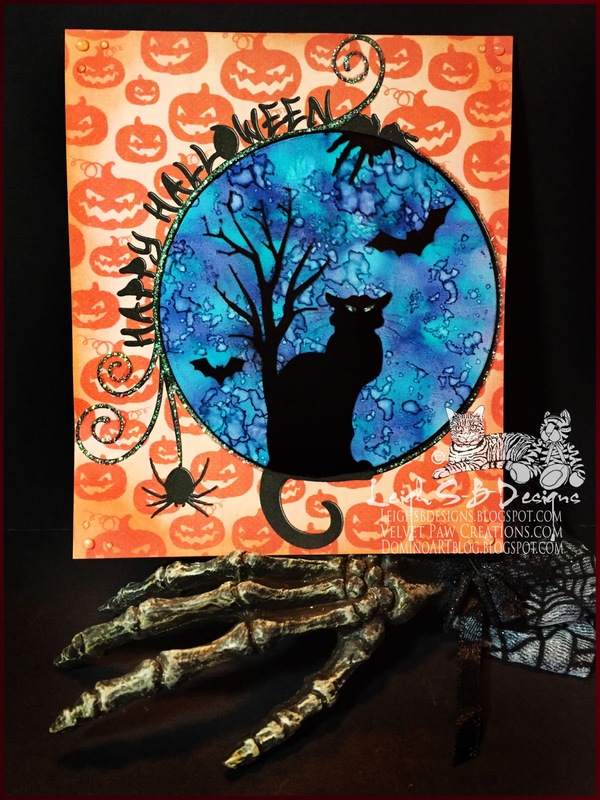 I made this one for my Mom using Bugaboo's dig stamp, Happy Halloween Cat Silhouette. 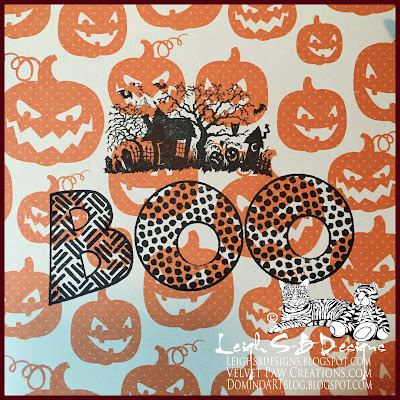 First I scanned a sheet of decorative pumpkin paper and added the digi stamp in Photoshop CS6 before printing it out onto white cardstock. I then printed out just the digi stamp on a printer transparency sheet. I applied Alcohol inks in blues and purples onto the reverse side of the transparency and cut out the circle. I then removed the circle from the cardstock print to create the luminary window and adhered the transparency inside with tape. I then adhered a white cardstock panel to the inside, covering the transparency. I completed the front of the card with Dried Marigold Distress Ink applied to the outer edges, applied Crystal Stickles glitter glue around the circle and on the flourish and then Viva Pearl Transparent Magic White dimensional dots added to all 4 corners. The photo above shows the card in daylight. You see how vibrant and pretty the blues and purples are but then the magic happens in the evening when you turn on the flameless tea light inside the card. The last photo below shows how dramatic it is in darkness too! Ooooh aaaaah, so pretty! 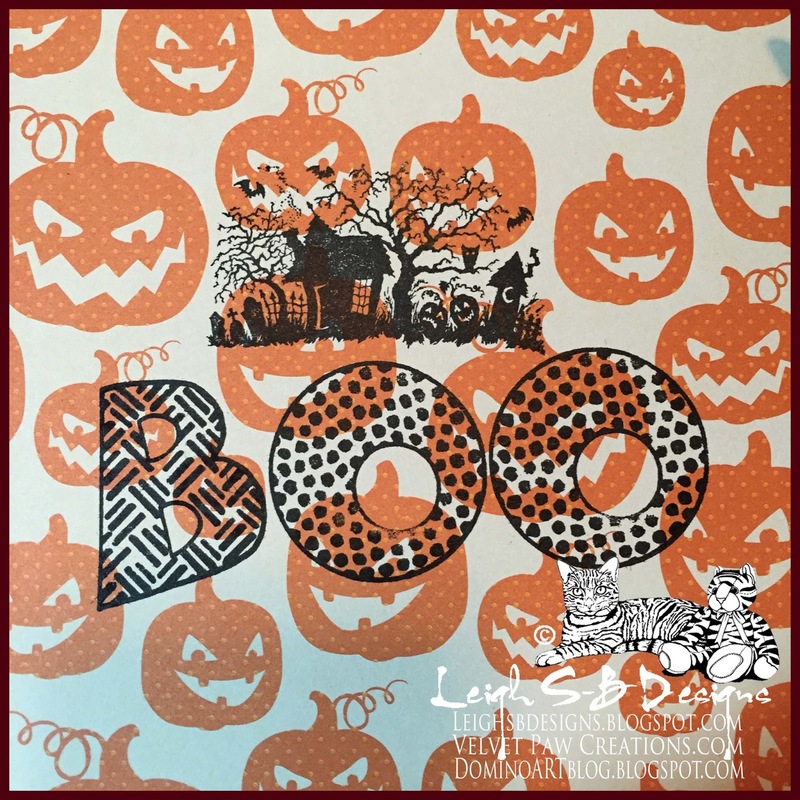 The real pumpkin paper was added to the inside and stamped with a scene by PSX and the word BOO (can't remember who made this foam stamp set..possibly All Night Media) in black Versafine ink. Wow, this luminary card is beautiful! I love the technique...thanks so much for sharing! It really is magical! Love the blue and purple and then the look at night with the candle light! Thanks so much for joining us at Catch the Bug! This is truly amazing!!!! What a fabulous project and soooooo spoooooky!!! Thanks for joining us at Catch the Bug. Ooh my, thank you so much for the tutorial and for a fabulous project your share with Dream in Darkness -challenge. Card is fabulous on a daylight but with a light, WOW! Great effect with the transparency, Leigh. Thanks for joining Catch the Bug! So cool, love this one too! Those blues and purples are awesome, so pretty even when it isn't in use as a luminary. Thanks for sharing with us at LOC! WOW - this is FABULOUS!!! Thanks so much for playing along with The Bug Blog/Bugaboo Stamps weekly challenge. We hope you'll join us again this week for our Black, White & a POP of Color challenge!